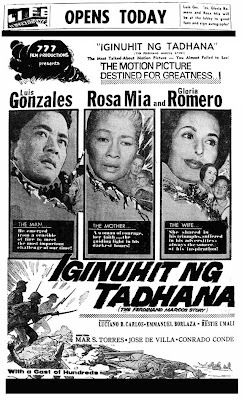 In 1965, the Board of Censors suspended the movie exhibition of Iginuhit ng Tadhana (a movie biography of Presidential candidate Ferdinand Marcos). Many believed and suspected that Malacanang had a hand in the board's decision and such action was a wrong political maneuver and ploy that proved disastrous to the reelection bid of incumbent President Diosadado Macapagal. It practically ensured the Presidential electoral victory of Marcos. Let’s relive that moment in history from the front pages of The Manila Times. 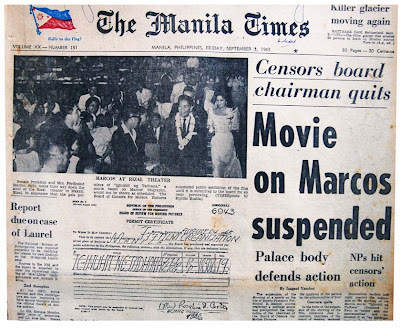 The suspension of the showing of a movie on the life of Senate President Ferdinand E. Marcos stirred yesterday a political storm and precipitated the resignation of the chairman of the Board of Censors for Motion Pictures. Officials of the board said that the board voted to suspend the exhibition of the movie, “Iginuhit ng Tadhana” (Destined by Fate) because its producer failed to submit it for preview by the board en banc or by the entire board. The film had been approved for showing by a subcommittee of four headed by Mrs. Rosalina I. Castro last August 24. The board said it interpreted the refusal of the movie company, the 777 Film Productions, to comply with its order as defiance of the Board. The order of the board also suspends the showing of the movie in eight provinces and cities--- Camarines Norte, Batangas, Marawi City, Pampanga, Cotabato, Aklan, Masbate, and Sulu. The film has been showing in theaters in these places since Aug. 24, the date of the approval of the picture by the subcommittee of four. In the wake of the suspension of the showing of the film, columnist Jose L. Guevarra, chairman of the board of censors, tendered his resignation. Guevarra did not state his reason for resigning in his letter to President Macapagal, but sources close to him said that the resolution of suspension, which was adopted in his absence, had something to do with it. 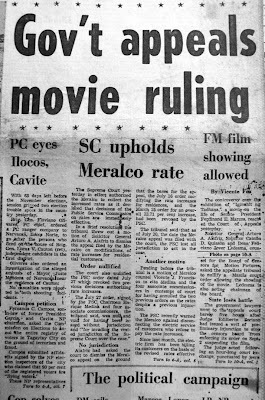 Nacionalista leaders last night assailed the suspension of the showing of the Marcos movie, “Iginuhit ng Tadhana” (Destined by Fate) as “unfair and unsportsmanlike” and denounced it as an infringement on the freedom of expression.” The order of the Board of Censors for Motion Pictures caused the postponement of a press preview of the movie at 2 p.m. and the gala premiere at 8 p.m. yesterday, both scheduled at the Rizal Theater in Makati, Rizal. Senate President Ferdinand E. Marcos, NP Presidential candidate and the subject of the movie, apologized to the gala premiere audience at the Rizal Theater for the inconvenience caused them. Marcos appeared before the audience briefly with his wife, Mrs. Imelda Romualdez-Marcos and his running mate, Senate President Pro-tempore Fernando Lopez. 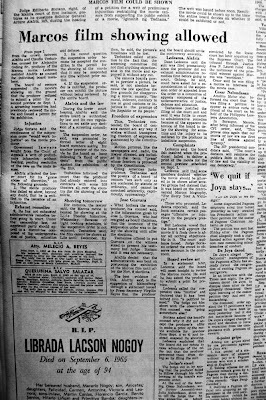 The movie film showing was later allowed but the damage caused by its suspension had caused tremendous dent on the political campaign of President Macapagal.